As of October 2015, Vintage MG Parts now has its own highly accurate tooling for the production of MMM Trunnion Dust Covers for all MMM models. 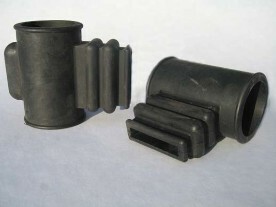 These include the smaller Midget / Magna dust covers as per the C/D/F/J/P and L types, for both front and rear. 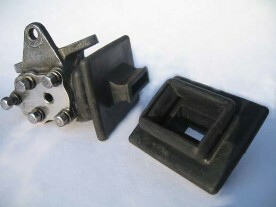 All front dust covers have been designed to have a strong grip to the trunnion box lip. We have decided to introduce a new supply of the rear dust cover as the only previous overseas source incorporated a known design flaw in that the bore for the rear chassis crosstube was oversize and did not grip the tube tightly enough to retain grease. Our bore is designed undersize to address the problem. To the best of our knowledge, there has not been a reoproduction source since the 1930s for the supply of larger K/ KN and K type models. Up until now, enthusiasts have had to make do with stretching the smaller Midget / Magna trunnion dust covers over the wider though thinner main leaf on the road spring and, the larger rear chassi crosstube diameter. This always results in splitting and tearing of the covers over time. One of the additional shortfalls when using the smaller rear dust covers on the K , KN and N types is that the leaf spring rear ends pierce their way through the rubber bulge on the dust cover over time. Our dust covers also incorporate the wider buldge to correctly address the problem. We now have front and rear dust covers currently in stock and in both sizes. Dust covers for the K, KN and K models are available only in limited stock. We will not be organising a replacement batch once these are sold out as we have to order a minimum quantity for these to be commercially viable and this is a product where demand will steadily diminish over time as these will not generally wear out. All dust covers are made from an oil resistent rubber which also contains UV protection additives.